Whether you're looking for a simple storage option, want to build your own back yard workshop or need a place to store gardening tools and supplies, Stoltzfus Woodworks offers quality-built storage sheds for every need. We offer a variety of shed models that can be easily customized to suit your style and store all your gear! For those who value old-fashioned charm and simplicity, our Quaker design is the perfect fit. Available in Duratemp painted or vinyl siding, the Quaker features 2 windows, double doors and 30-year roof. The classic styling of our A-Frame sheds offers versatile storage options and useful features. Available in Duratemp painted or vinyl siding, the A-Frame style features 2 windows, double door that can be easily repositioned to meet your needs. Designed to fit in smaller back yard settings, this barn-style shed maximizes storage space from floor to ceiling. Available with convenient double doors and gambrel roof for added headroom. Choose Duratemp painted or vinyl siding. 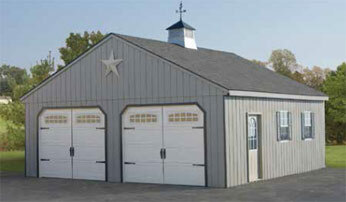 Maximize your storage space with our classic High Barn design that features barn-style roof and optional loft storage. Features double doors for easy loading and unloading and is available in painted Duratemp or vinyl siding. Offering versatile storage capacity and attractive styling, the Dutch Barn is a popular shed for avid gardeners. Add an optional loft or workbench for added storage or workspace. Choose Duratemp painted or vinyl siding. The Dutch Barn comes standard with 2 windows and a double door. Our Hip Roof shed offers a uniquely pitched roof for added beauty. The Hip Roof also comes standard with 2 windows and double door. Outfit your shed with Duratemp painted siding or upgrade the look with available vinyl siding in a variety of colors. The perfect companion to the back yard pool our Pool House offers a convenient changing area, elegant windows and doors and a built-in porch for relaxing on hot summer days. Our Pool House also features attractive vinyl siding and hip-style roof. Ask about additional upgrades to make your new pool house even more comfortable and inviting. Not sure which shed model is best for your needs? Let us help you decide! Contact Stoltzfus Woodworks today and tell us about your storage needs! Choose from Duratemp painted siding or maintenance-free vinyl siding.